Keeping cats indoors has many benefits, such as: reducing the risk of transmissible disease, elimination of predators, controlled/regular feeding schedules, safety from vehicles and the elements, but sometimes it can seem like our feline friends are lacking something. We know that keeping cats indoors has many benefits. 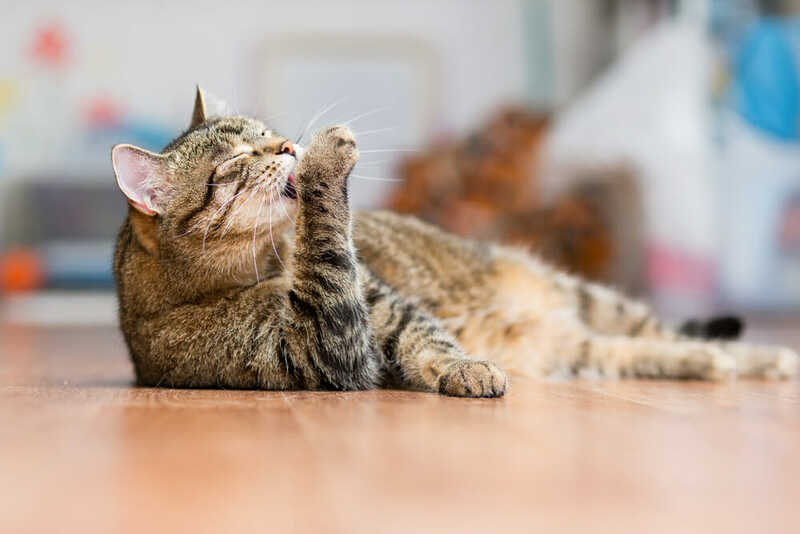 Domestic house cats have adapted to this comfortable lifestyle, but we also want to ensure that we are providing them with adequate and safe stimuli to keep them healthy and happy. Environmental enrichment serves to create an indoor living environment that allows cats to be cats, without the dangers of the outdoors. Environmental enrichment is a catchall term for anything we do to create a more enriching, and stimulating living space for our cats. It can include cat trees, scratching posts, water fountains, various toys, and even quality time with their humans. One way to enrich our environment for our felines is to feed them in ways that mimic their natural instinct for prey-hunting behaviour, which can have the added bonus of cats feeling mentally stimulated, and less stressed within our homes. This can work with all food types, whether Fluffy prefers pate canned food, or if he is a strict kibble kind of guy, or even to be used with the occasional treat. There are many great items on the market, such as cat treat puzzles and mazes. There are two general types: rolling (such as a treat ball) and stationary. 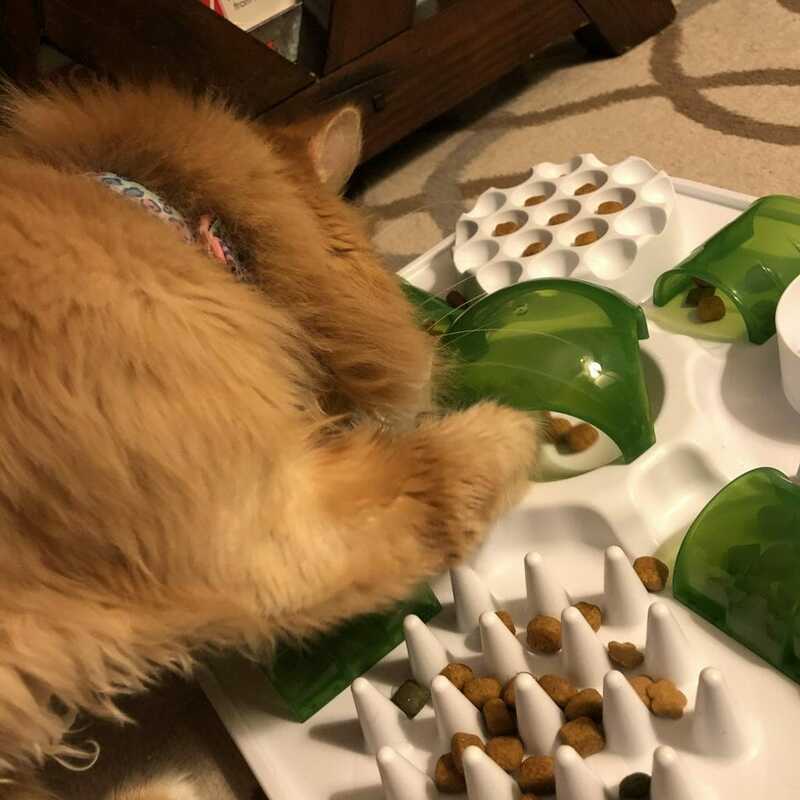 Stationary feeders or puzzles are often containers (plastic, or homemade) that have tunnels, divots, and holes that force the cat to use their paws to reach, dig and trap the pieces of food much like their wild ancestors. Commercially available products are one option, but homemade puzzle games and toys are just as effective for your feline friends. A great resource is, foodpuzzlesforcats.com, this website has links to products you can purchase, but also instructions how to create your own cat feeder puzzles at home with supplies you already have, such as toilet paper rolls, Tupperware containers, boxes and even ice cube trays! Allowing cats to hunt and forage for their food can reduce stress, and benefit their mental health. Puzzle feeders can also be used as a weight loss, or weight maintenance tactic. Measuring out the amount of food is important to ensure your feline is getting enough food. Meals can be measured out and placed into various puzzle-style feeders, or even hidden around the house. This forces the cat to work for their food by hunting and foraging, which not only can increase exercise, but also slow down their eating which can be great for cats that tend to gorge themselves or eat too quickly. Foodpuzzlesforcats.com has many suggestions about how to start slowly with your cat, with more simple setups, especially if they are new to the food puzzle game. 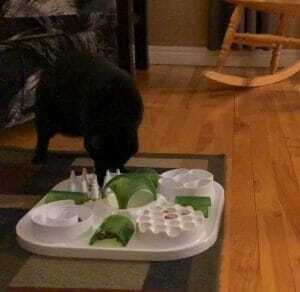 For instance, a Tupperware container with holes cut in the top can be an easy beginner feeder puzzle for your cat. Place some food inside and watch them use their adorable little paws to fish out pieces of kibble – fun for them, and fun for you to watch! 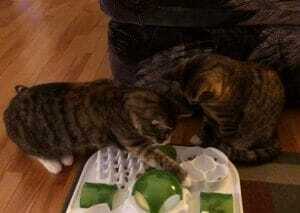 Most cats catch on quickly and can move up to more complicated commercial or homemade feeder puzzles. 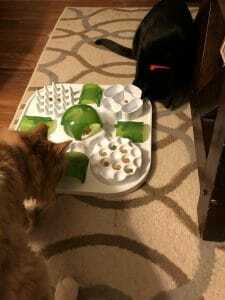 Below are some photos and videos of some of our beloved felines using some interactive feeding puzzles.